Pilot's Discretion: It's finally summer! One of the many things I remember having from last summer are thunderstorms. Summer is often known for its wicked thunderstorms making flying that much more challenging and fun for pilots. I’ve always been fascinated on how such a simple thing as water can bring the wildest of the west and the hospitality of the south mix ‘em all together and bring weather to the northeast, most of the time. Today I was probably asleep for only three to four hours so far when something triggers my senses and I wake up, and to my demise a thunderstorm cell is just passing by overhead. Oh it was a quick one, I had probably captured its worst stage even though it wasn’t that crazy of a thunderstorm, I was at the heart of it for a few minutes. 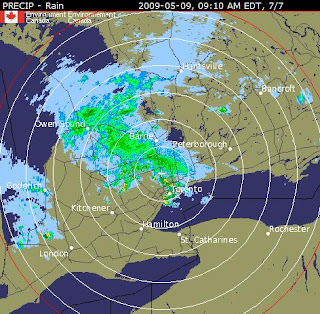 As you can see from this radar, just above Toronto (where I live) is a tiny spec of red indicating severe thunderstorm in that particular location at that particular time. Can you say lucky? I actually took a video of it and started to see sheet lightning which is lightning cloud to cloud or in cloud and that it reflects off the whiteness of the cloud making a huge part or “sheet” of the cloud above us glow momentarily. Then I started to see some ice pellets or snow pellets, I can’t really tell them apart visually but I know that snow pellets is GS in the METAR which means Graupel Small and Graupel stands for hail, and hail as we all know can be existent in strong thunderstorms such as this one. Then I thought I wonder how the big time airline pilots are coordinating with ATC to go around this thunderstorm cell and proceeded to listen to Toronto Centre at liveatc.net. At one point, tower even mentioned, “we went from RWY 06 to RWY 33 to RWY 24 in the span of 8 minutes”. 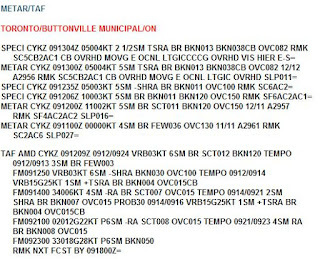 I was glad to hear the pilots not being forced to go a certain route and just use their own judgement about which way to deviate for weather as they manage to depart or arrive from/to Pearson. As the radar picture dictated, the really bad weather wasn’t going to last long because it was moving fairly fast. And so after a maximum of 8-10 minutes, I took a picture outside and it was very bright, still quite low clouds but no rain and light winds. I could go into more detail about thunderstorms and all of their effects and so on, at least as much as I have learned over the past 2 years, but I’d leave that to another post. I just wanted to note that, SUMMER IS BACK, and one of the many signs is the brewing of wicked, illustrious, lustrous, VERY EVENTFUL thunderstorms. Goneometers, engines failure, and 5 babies!